The directions for the netted flower components can be found in the book, "Crystal Brilliance," item #BK-CB. The book contains instructions for a bracelet, and we made the following changes to make this necklace. For the center stitched component, we started with seven 4mm bicones instead of 5, and used two groups of seven 3mm bicones as well. The seed bead counts remained the same. We stitched the square shaped loop at each end of the stitched component, and added a jump ring to attach the chain. After stitching the middle component, cut six 3/4 inch length of chain and two 3 inch lengths of chain. Make the wire wrapped components using the 24 gauge beadwire, bicones and seed beads. Attach the wire wrapped components to the chain, and add the trigger clasp. Please note: this necklace measures 17 inches and we used approximately 11 inches of chain to make it. If you want to make the necklace longer than 18 inches, you will need to order 2 feet of chain. 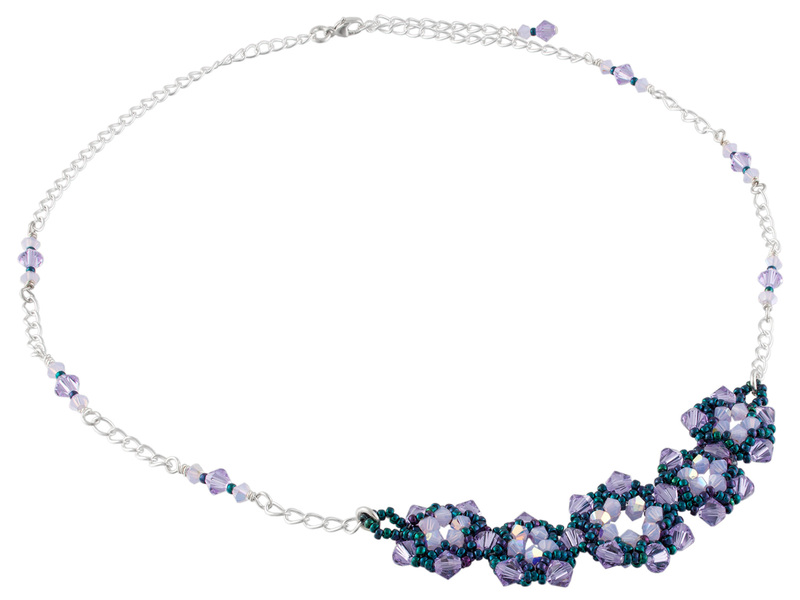 Note: our original design called for 3mm bicones in Violet Opal AB, which has been discontinued. We have replaced it with 3mm Violet Opal bicones.